Is Hillary Clinton Blaming The Vast Right Wing Conspiracy For Email Scandal? Did I miss a memo? When was the VRWC declared back on? Chuckie: Umm, you might have…you may have been running for president in the future and you wanted to make it a little more difficult for congressional investigators to subpoena your government emails, and a little more difficult for Freedom of Information Act requests. Is that a fair theory or not? HRC: It’s totally [shakes head no with the permanent ping pong balls in her cheeks expression] um, ridiculous. That never crossed my mind. And in fact, since more than 90% of my work related emails were on the system, they are subject to FOIA or any other request. That’s how the Benghazi Committee got the emails even before we went through our exhaustive process. Now, I have been involved as you are pointing out on the receiving end of these accusations, as you might remember during the 90’s there were a bunch of them, and, you know, all of them turned out to be not true…. The exchange happens at roughly the six minute mark of this video that is NBC’s intellectual property. Hillary rolls on a little father, and she more or less says it’s part of the game to be played. But, her message is clear: she’s going to deflect blame and laugh it off until the orange outfit she’s wearing is a jumpsuit not a pantsuit. The only thing new here is the color orange. Interesting…the Vast Right-Wing Conspiracy has been declared alive and well, and no one bothered to tells its members that we were supposed to hop to. 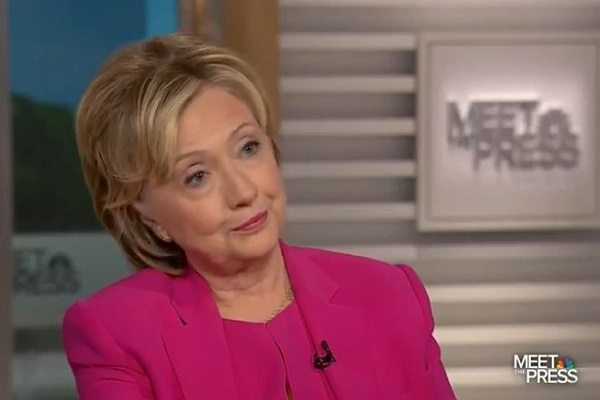 Hillary seems to be the only person really in the cross-hairs of the Vast Right Wing Conspiracy AND the only one who seems to be caught in the web of a private email server scandal where not only was top secret information on an unsecured server in a private residence, but that a whole lot of it was “deleted” and the perpetrator not only lied about it, but is still not in jail. Even John Kerry and Debbie Wasserman-Schultz aren’t in that class. Just to be clear about this: here we go again. Deflecting blame and laughing off allegations of felonies. How long before her teflon gets scratched? Are Middle Class Shoppers REALLY Avoiding Walmart? WATCH: Ronda Rousey gets Asked About Equal Pay, Her Response Made Feminists FURIOUS!